Budget 2016 had proposed provision to allow transfer of EPF to NPS. Nearly after a year PFRDA (Pension Fund Regulatory and Development Authority) has come out with guidelines on “How to transfer EPF/Superannuation Fund to NPS”. 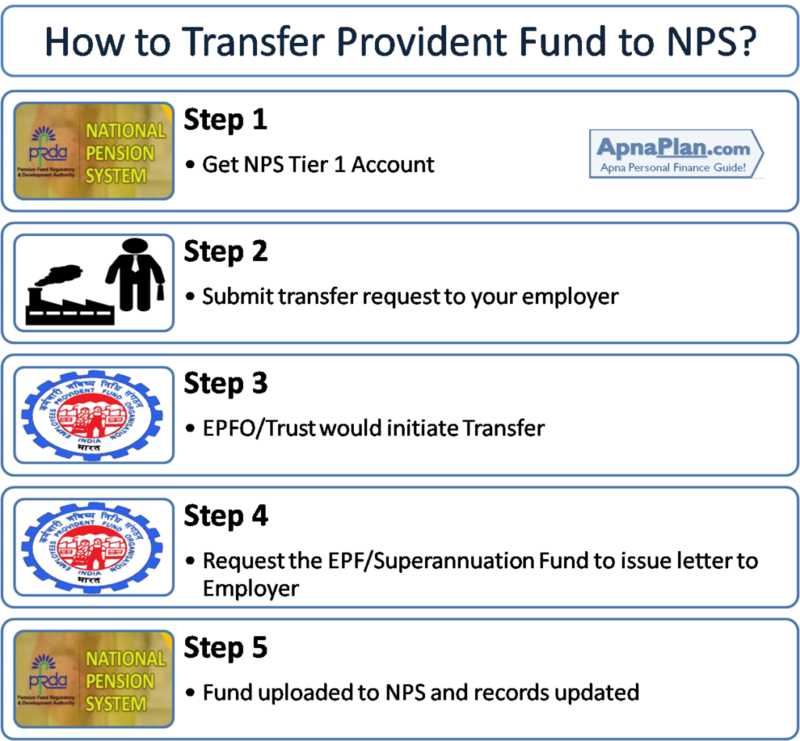 How to Transfer Employee Provided Fund to NPS? The subscriber should have an active NPS Tier I account which can be opened either through the employer (where NPS is implemented) by filling up the prescribed subscriber registration form or through the Points-of-Presence (POPs) (Banks/non-banks entities registered as POPs with PFRDA) or online through eNPS on the NPS Trust website . If you already have an active NPS account you already saved your first step. Both Government and Private Sector employee has to submit a request to transfer his EPF/ Superannuation Fund to NPS to his employer. There is NO specific form or format that has been provided, so a request letter with all the NPS & EPF details should be sufficient. In case of Government Employee, the employee should request the recognized provident fund/ Superannuation Fund to issue a letter to his present employer mentioning that the amount is being transferred from the recognized provident fund/ superannuation fund to be credited in the NPS Tier I account of the employee. In case of Private Sector, the employee should request the recognized provident fund/ Superannuation Fund to issue a letter to his present employer/POP as the case may be mentioning that amount is being transferred from the recognized provident fund/ superannuation fund to be credited in the NPS account of the employee/individual Tier I account. The money received is uploaded in your NPS Account through your employer or POP as the case may be. The employer can upload money through Arrears mode and mention “transfer from recognised provident fund/ superannuation fund” in the remarks column. Also Read: Should you Invest Rs 50,000 in NPS to Save Tax u/s 80CCD (1B)? 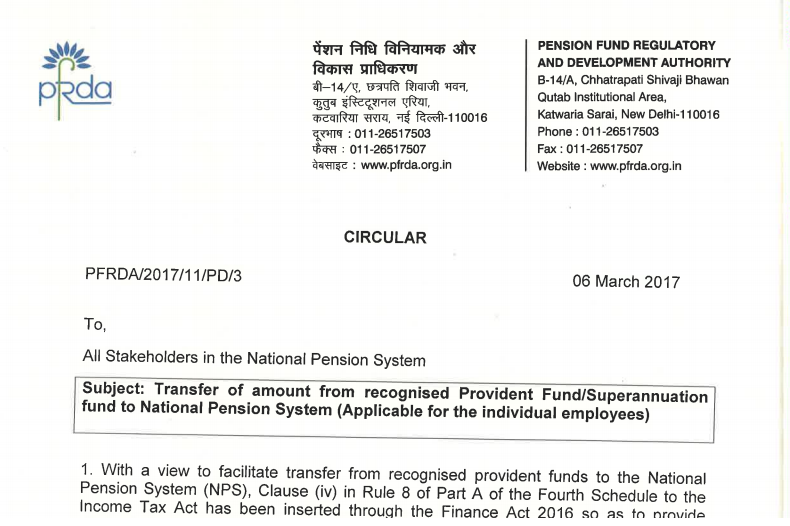 The circular clearly says that subscribers can transfer money from EPF/superannuation fund to NPS just one time. There would be NO Tax implication on this transfer as it is NOT considered as income of the current year. Further, this transfer of fund will not be treated as contribution of the current year by employee/employer and accordingly the subscriber cannot take tax benefit on this amount. Should You Transfer your Provident Fund to NPS? As the steps of transfer have been notified, the next question is Should You Transfer your Provident Fund to NPS? Looking at present circumstances I would say NO – do not move your EPF to NPS. 1. In case of EPF the return risk is with the Government while the risk shifts to subscriber in case of NPS. The reason why government wants you to shift to NPS. 2. EPF gives you highest tax free & risk free returns. 3. Provident fund is 100% tax free while NPS is partially taxable on maturity. 4. You can withdraw fully or partially from your EPF funds before retirement. This is quite complicated in case of NPS. 5. At maturity you have to compulsorily buy annuity with 40% corpus in case of NPS. In case of EPF you are free to use the way you want. However if luck favors, you might be able to generate higher returns from NPS as you can invest 50% of corpus in Equity. However this comes at increased risk and I would not recommend. If you want to invest in equity do it with your regular savings. We would be doing a more detailed post on Comparison between NPS and EPF soon. There are still questions on how it would work for employees who have mandatory EPF but no NPS from employer. The contribution in NPS is 10% of basic + DA each from employee & employer. This is 12% in case of EPF. How this would be synced? The process of moving EPF/superannuation fund to NPS has just been notified and you may face issues if you are first movers. I recommend you to wait at least for next few months before initiating any transfer. How about Superannuation transfer to NPS pros & cons, benefits etc?